“It definitely isn’t,” says my wife, of the man we imaginatively christen ‘Swedish Alec Baldwin’, “but I see what you’re getting at.” She’s right: it’s not him, though from our vantage point – dining alfresco in the small coastal town of Fjällbacka in West Sweden, looking out over people, piers and boat masts to tiny islets – being whatever and whoever Swedish Alec Baldwin is looks like a lot of fun. This being early June – and therefore two weeks before the endless days, family gatherings and vacated cities of Midsummer kicks in – Fjällbacka has the baggy air of an out-of-season up-market resort town – all half-closed boutiques, quiet restaurants and just a sparse dusting of the moneyed visitors that will fill them to bursting in a fortnight. Alec, his friends and their boats feel like a presage of a very different, future Fjällbacka from the one we’re visiting. 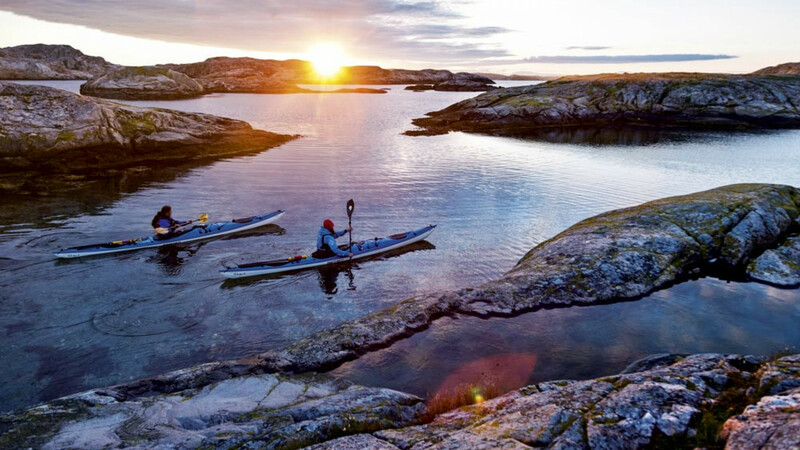 For this reason, as people keep telling us, it seems we’ve accidentally chosen the perfect time to visit West Sweden’s Bohuslän archipelago. 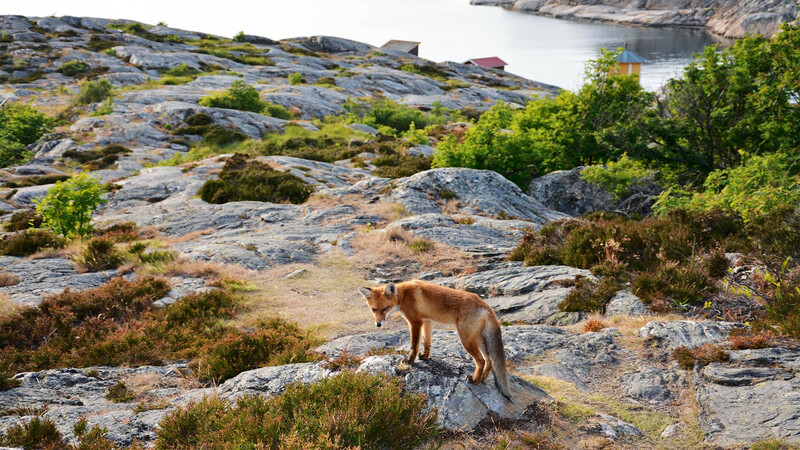 These islands – some barely big enough to lie down on, others home to towns, ports and people – are strewn along the coast like dripped grey wax, stretching more than 150km from Gothenburg (or Göteborg, in Swedish) to Norway’s northern tip. 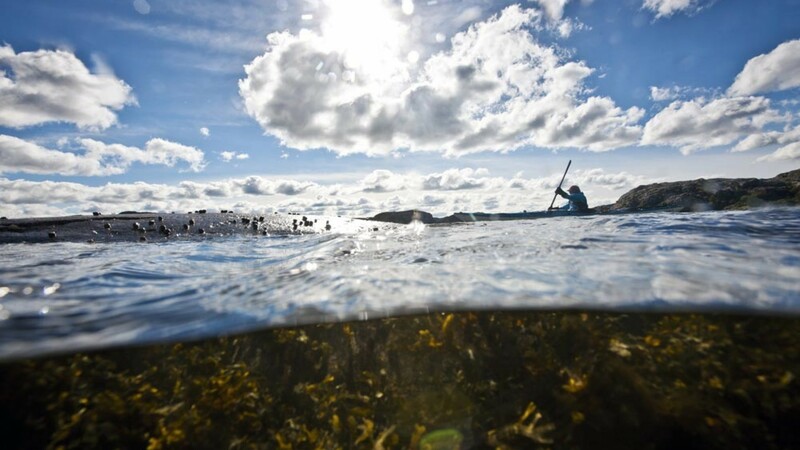 In summer, the sleepy towns and long stretches of wild coast flood with holidaymakers from Sweden’s cities and from Norway, many of whom take to the seas (Swedes supposedly own more boats per capita than almost any other nation) to hop from island to island and town to town. In Midsummer, one person we meet tells us that the cities are deserted as their inhabitants make for the sea. “Gothenburg,” they say, “is like a ghost town”. 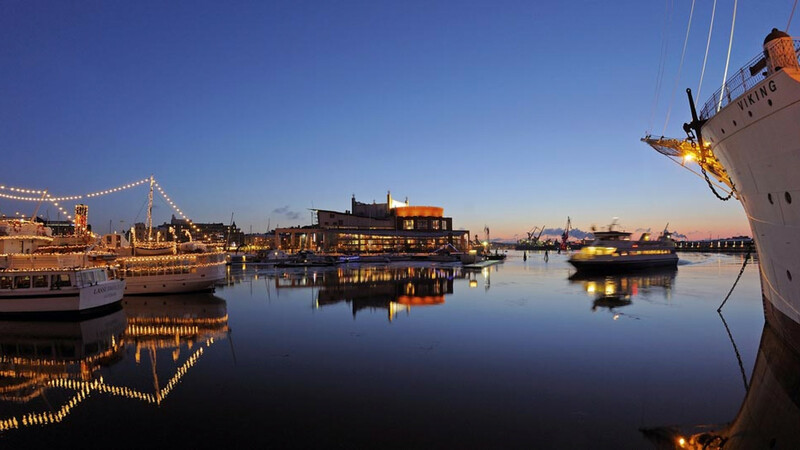 Sweden’s de facto second city is the starting point for our road trip up and down the Bohuslän coast, and when we visit there’s actually nothing ghostly about it at all – Gothenburg buzzes with the quiet energy of a small-big city at work. The area’s main employer is car manufacturer Volvo, but camera maker Hasselblad (several of whose cameras have been to the moon) and hipster denim makers Nudie are also based in the city, and the working harbour, with its cranes and warehouses and other industrial furniture, contrasts starkly with the cutesy Amsterdam-lite canals and historic buildings. We wander through the cobbled streets of the Haga district, with its wood-clad houses, coffee shops and antique emporiums; brave driving rain on a Paddan boat tour along the canals, dipping under bridges so low they almost decapitate us; and get fully onboard with the Swedish afternoon staple of fika – guzzling coffee and eating sweet, spiced pastries (some so big you could wear them as a hat) in Da Matteo on trendy Magasinsgatan. The dense web of streets in the centre of the city, hemmed in by narrow canals and the mouth of the Göta älv river, conceals countless shops, from influential denim boutiques and record shops to stark, impossibly hip (this is Sweden, after all) design shops that look like they’ve been dropped onto the street straight from the pages of Kinfolk. Even the city’s beautiful botanical gardens, a short tram ride from the centre in the south of the city, are so tasteful they look like they’ve been painted onto the landscape. Bigger, though, is a relative term – particularly in this part of Sweden. The country covers an area nearly twice the size of the UK, but its total population isn’t much higher than London’s. 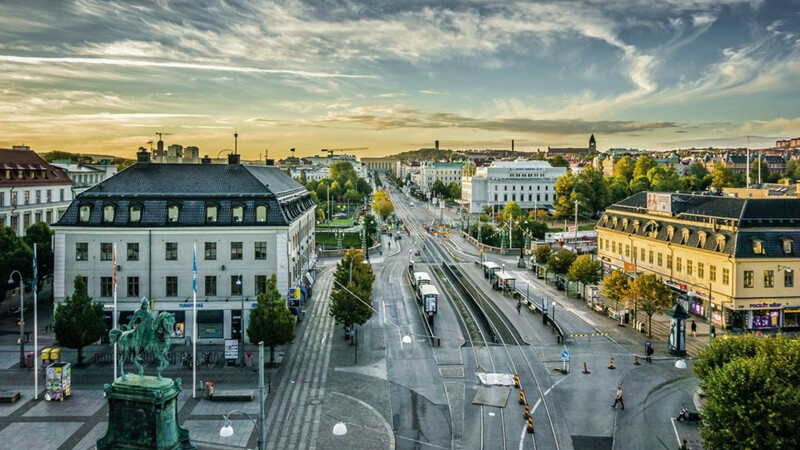 Gothenburg’s half a million people (about the same as Manchester) make it Sweden’s second-largest city; drive away from it, as we do, and it grows bigger and more sprawling in your memory with each dinky town and village we pass through. Our first stop – two-and-a-bit hours’ drive north of Gothenburg – is Edshultshall, a tiny settlement on the island of Orust, just outside the ‘larger’ village of Hälleviksstrand. Despite its brightly painted exterior, we manage to drive past our B&B twice. Once we’ve located it we’re welcomed by Marcel, a warm and friendly Dutchman who settled here with his partner, Johan, who’s a native of this staggeringly beautiful place – albeit one who’s spent much of his life away from it. 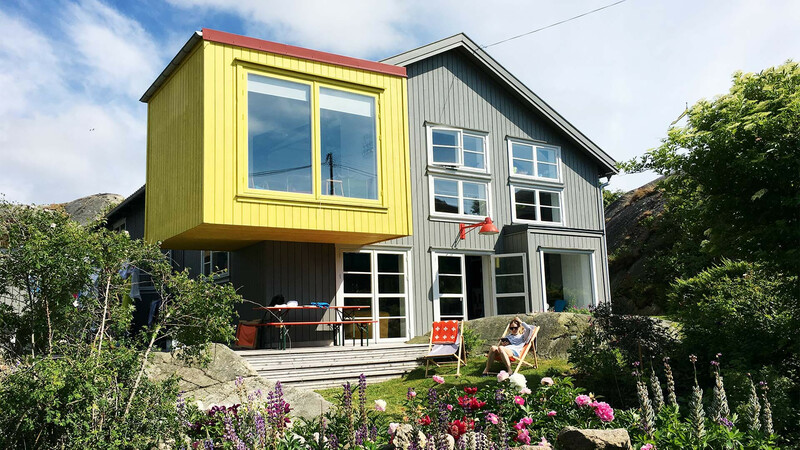 They built Lådfabriken from the remains of a fish-box factory (which, conveniently, is what the name translates to), initially to live in, and later to share with guests. You can see why they’d want to do so – the blocky, colourful exterior is complemented by an interior design scheme that blends stark industrial materials – huge slabs of concrete, exposed metal struts – with eclectic, often kitsch artwork and objects from all over the world. It’s an arresting sight, but not half as much as the view from Lådfabriken, which pans out across low-lying granite islands and still, steel-grey sea. Here, perched on a rock at the end of the garden, we first experience the hypnotically beautiful light that washes over the landscape like nature’s own Instagram filter, as the last of the (very long) day fades into the (very short) night. It brings an eerie stillness – one that has the weirdly calming effect of seeming to freeze time. We make the most of our stay at Lådfabriken by borrowing bikes to gently pootle down the coast to neighbouring Mollosund, and Marcel helps us drag bright yellow kayaks down to the tiny bay at the end of the garden, which we paddle through a string of the now-familiar small islands until the towering metropolis – OK, sparse collection of dwellings – of Hälleviksstrand looms ahead of us. The archetypal Bohuslän dwelling is a small wooden building – Monopoly house-like in its proportions and painted blood-red with bright-white fittings – and we see countless examples as we island-hop our way to Fjällbacka, following a route scrawled on our paper map by Johan the previous night. We avoid the busier, faster route north and take coastal roads for the most part, which – this being an archipelago – means taking big and small bridges, as well as the odd chain-driven car ferry that lumbers from one island to another at a distinctly non-London pace. In Sweden, and among really dedicated fans of Nordic noir, Fjällbacka has found a kind of fame as the setting for the bloody crime novels of locally raised Camilla Läckberg – at one point we even see a sign for the start of the ‘Läckberg tour’, which takes in some of the books’ key locations. The novels’ heroine, Erica Falck, spends her time surrounded by killers, would-be-killers and small-town weirdos, but retains most of her ire for the town’s transient summer population: “A many-headed monster that slowly, year by year, swallowed the old fishing village,” as she puts it in her debut novel The Ice Princess. I can see why the monsters are drawn to Fjällbacka, though. This compact collection of attractive wooden buildings (blood red walls: check; white windows: check) huddles under a looming cliff with a cleft – the Kungsklyftan – running through the middle of it, and a wooden promenade juts out into the sheltered harbour. It’s picture-postcard drop-dead gorgeous – I’d summer here if I were a wealthy Stockholmer with a boat and a passing resemblance to Alec Baldwin. Fjällbacka is as far north as we get, and our return to Gothenburg takes in two more stops – first the island of Ramsvik, and finally Smögen, which has a reputation as a magnet for young Swedes hungry for partying in the summer. The two places are separated not only by about 10km, but also by a vast gulf in appearance and atmosphere. Ramsvik – separated from the mainland by a wafer-thin strip of water that runs along its east coast – has been home to a campsite run by the same family since 1958. Its current owner, Torbjörn Backlund, meets us at the campsite’s HQ and walks with us to the island’s coastal rock formations, where ravines and deep holes they call “troll’s kettles”, formed during the last ice age, punctuate smooth arcs of granite. Once Torbjörn has left us to our own devices we see few other visitors as we attempt to follow an elusive trail that wraps its way around the coast. The landscape is extraordinary – almost more so when we happen upon a tiny collection of red and white fishermen’s huts that cling like barnacles to a huge, flat expanse of rock. We meet one of the inhabitants walking down a track to her hut, and discover she’s just arrived from her home in Stockholm. The little red house has been her family’s holiday home for so long, she tells us, that some family members remember seeing warships pass by during the Second World War. We wave her goodbye and set off, and don’t see another soul until we arrive back at the campsite. Smögen, on the other hand, is buzzing with people – though like Fjällbacka it’s yet to hit its peak, Midsummer capacity. As it turns out, the town itself is much more attractive than the Blackpool-on-the-rocks I’d been expecting, with a pristine wooden boardwalk lined with little shops and restaurants on the terra firma side, and hulking white yachts on the other. 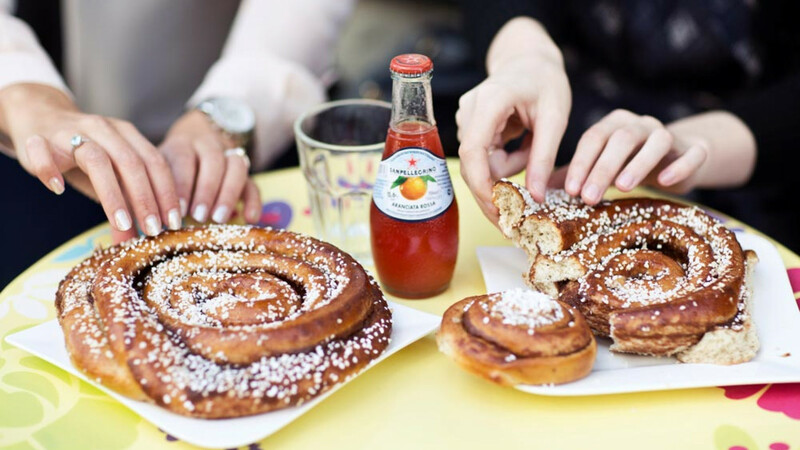 We chill in a quiet, waterside café, blasted by rays of sun, as we shovel down cardamom buns in a manner that suggests we don’t know where our next fix is coming from. clearly had the right idea.